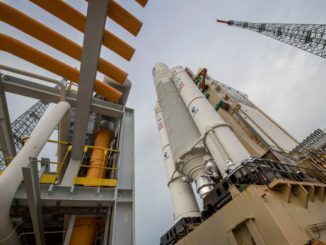 Launch of the 174-foot-tall (53-meter) rocket, flying with in its most powerful configuration with four strap-on solid-fueled boosters, is scheduled during an unusually-long nine-hour window opening at 0500 GMT (1:00 a.m. EDT; 2 p.m. Japan Standard Time) Saturday, the Japan Aerospace Exploration Agency said. The H-2A rocket is expected to roll out of its assembly hanger to a launch mount at the Tanegashima Space Center just after midnight Saturday, local time, for final launch preps and fueling. Ground crews transferred the rocket back to the assembly building last weekend after a launch attempt Aug. 12 was scrubbed in the final hours of the countdown. 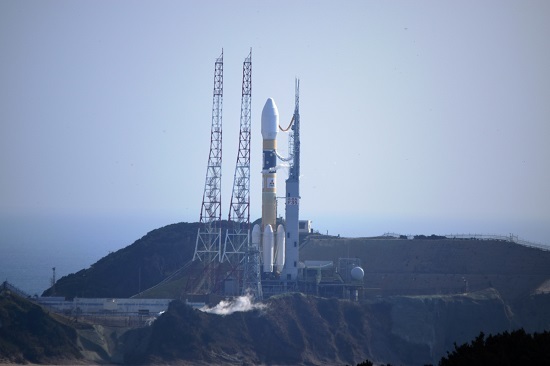 Japanese space officials told reporters in a press conference that the launch team detected a leak in the rocket’s helium pressurization system, which is used to pressurize the H-2A’s propellant tanks for flight. Mitsubishi Heavy Industries, the H-2A’s prime contractor and launch operator, fixed the problem. Officials set Saturday as the new target launch date “after careful investigations and completion of repair actions of the rocket propulsion system,” the space agency said in a statement. The H-2A flight was originally slated to take off Aug. 11, but officials opted to forego a launch attempt that day due to a poor weather forecast. Saturday’s launch will be the 35th flight of an H-2A rocket since it debuted in August 2001, and the fourth H-2A launch this year. The satellite enclosed inside the launcher’s 16.7-foot (5.1-meter) payload shroud is Michibiki 3, the third member in a planned quartet of navigation stations in Japan’s Quasi-Zenith Satellite System. Japan’s navigation satellites supplement positioning signals broadcast by the U.S. military’s Global Positioning System, providing more accurate location estimates for civilian and security users in the Asia-Pacific. 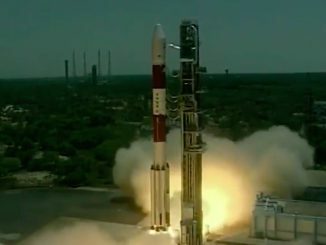 The regional navigation network will result in improved reception in urban areas and rugged terrain, where high-rise buildings and mountains can block signals from GPS satellites near the horizon. The GPS satellites circle Earth in orbits 12,550 miles (20,200 kilometers) above Earth. Although there are at least 30 operational GPS spacecraft, only a small fraction of the fleet is visible from a single point on Earth at one time. 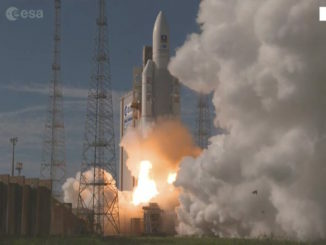 It takes four GPS satellites to calculate a precise position on Earth, but a Michibiki satellite broadcasting the same four L-band signals will give a receiver an estimate if there are not enough GPS satellites visible, or it can help produce a more accurate position calculation even with full GPS service. The two Michibiki satellites launched to date fly in inclined orbits, tracing figure-eight patterns as they oscillate north and south of the equator, while their longitudinal, or east-west, position remains over the Asia-Pacific at an average altitude of around 22,300 miles (nearly 35,800 kilometers) above Earth. Michibiki 3 will head into an orbit at the same altitude, but will eventually settle into a parking slot over the equator, where it will remain in a fixed geostationary position in the sky. The fourth in the current series of Japanese navigation satellites will go up later this year on another H-2A rocket, taking up a post in an inclined high-altitude orbit like the first two.